If you are a parent, you know that accidents happen. 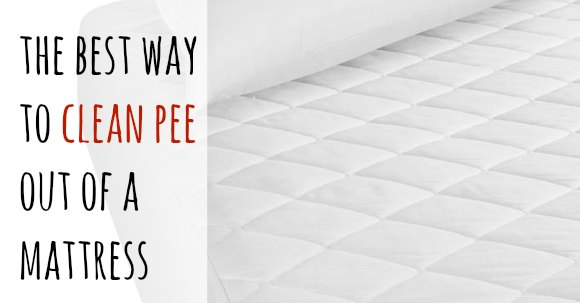 Learn how to get pee out of mattress. The solution is simple and you probably already have everything you need at home. Ok, I know this is a weird topic, but if you are a parent you know this happens. 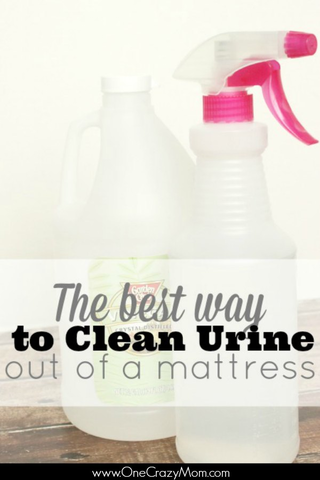 I am sure many of you have thought about how to clean pee out of a mattress. One of our children had an accident in the middle of the night. The problem was that the mattress protector wasn’t on the mattress. 🙁 We were left with pee on our mattress. GROSS!! The real problem was we were not told about this accident until the next evening when we found it. Even grosser! That means not only was there pee on the mattress but it was now stained and smelled horrible. I had no clue what to do. I set out to find out how to get urine out of mattress. It’s actually not that hard! Thank goodness. 🙂 I learned the best trick ever! The stain and smell will be a thing of the past! Once you learn how to get urine out of mattress, it is simple and inexpensive. My kind of solution. If the accident is fresh, you want to pat the urine stains to get the excess urine out of the mattress. If your stain is dry, then skip this step. In an empty spray bottle, mix warm water and vinegar (equal parts). I just eye ball it. Spray down the stain liberally – Soak it. Allow the vinegar solution to penetrate the stain. Pat it with a clean towel to soak up the excess. You can also use paper towels. Allow the mattress time to dry completely – normally 4 hours or more. 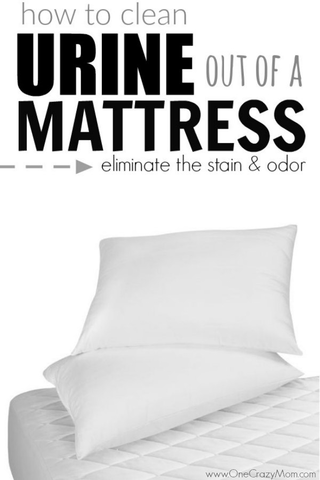 Now that you know how to get pee smell out of mattress, it is that easy! I love that we have a solution that is so easy to do and budget friendly. No need to spend tons of money to get the job accomplished. The solution is so simple and inexpensive. Please let us know how it works for you once you try it. Accidents are inevitable so it’s nice to have a plan just in case. I like to use peppermint oil or purification essential oils to help with the vinegar smell. However, once the vinegar dries the smell goes away. Learn more on how to use essential oils.There are so many great uses. We use them daily around here. It’s also a good idea to make sure to get a mattress cover to prevent it from happening again. That way you can just toss the mattress cover in the washing machine. I was shocked. This actually worked! We did this with our mattress and you can’t see the stain or smell the stain once the mattress dries. Win-win! I was seriously impressed! Next time you have this accident, make sure you try an easy vinegar and water solution. You don’t have to pay a ton of money for weird cleaning solutions when this worked great! 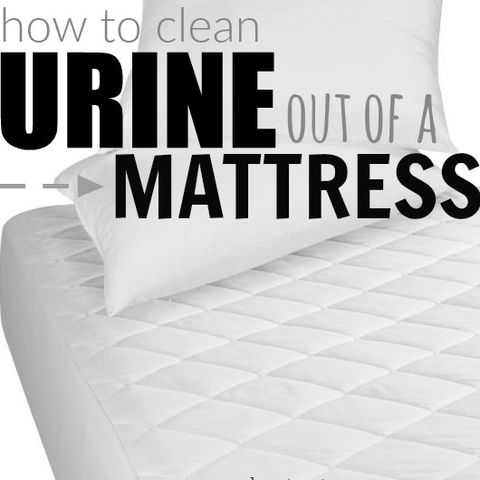 It’s so simple to learn how to clean pee out of a mattress. No need for fancy mattress cleaner! Getting pee out of mattress only requires a few simple ingredients. You can also use dish soap and a tablespoon of baking soda but it didn’t work as well for me as the vinegar mixture. This cleaning solution is very budget friendly. The mattress stain will be gone! No more worries about pee stains. This stain removing trick is amazing! Let’s face it with kids there are going to be wetting the bed issues. Now, you can just use this trick when accidents happen. You will be pleased with how much you save and how little time it takes. We are always making something around here. After you work on your mattress, try making Homemade Liquid Hand Soap . It is so easy! I know my family is using really good products and that makes me feel good as a Mom! Life is so busy but these natural ideas really do take very little time to make. I think you will be pleasantly surprised how quick and easy it is to make your own products at home. This solution for removing pee from a mattress is another great tip for getting the job done naturally! I always try to find a natural solution first. Usually I am successful. It’s much better than pouring chemicals into your home. We also save money as well. It works out so well for our family. You might also like 10 Uses for Vinegar to help save you money. It is amazing what vinegar can do. Some of these might surprise you. It’s great to have all these tips and tricks on hand for when life happens! No need to run to the store and spend tons of money on products. The solution is often simple and the ingredients already in your house. That’s my kind of solution. Budget friendly and simple. Try this homemade carpet cleaner for an easy way to get stains out. Only 2 ingredients needed!